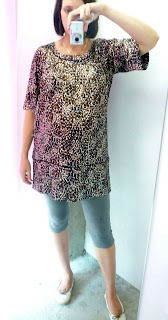 After documenting the impressive selection at the Daffy's pop-up store, I decided to see if I could find any maternity love amongst all the cute dresses. I'm not quite ready to do the full-on reveal, but I think this side view gives you an idea. Let's just say I've grown a good pedestal for the belly. Which is why, for most women who carry big, non-maternity will not hang well over the rear in your last months. Oh, OK, in your middle months too. But this purple top ($16.99) surprised me. It looks perfectly fine from behind. 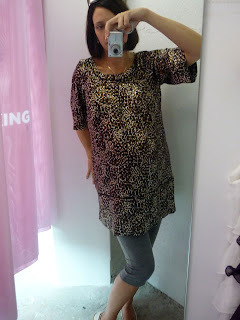 A clerk picked it out for me, and I politely took it into the dressing room thinking "No way. I'm going to look like an enormous, purple, ruffle tree." I shall no longer inwardly scoff at salesclerks recommendations. At least not till I've got it on in the dressing room. Not bad for tiered ruffles. You must be one of the cutest pregnant ladies in history! Both of those tops are really cute! And may I say that I am beyond impressed at the itsy bitsy teeny weeny-ness of your ankles!!! You may very well be the only preggo woman in history who hasn't been cursed with cankles! You guys are seriously too kind. And really good for a pregnant gal's ego! Lipstick, I'm pretty sure the cankles are just around the corner. I've still got about 2 1/2 mos. to go. You are looking so lovely, darling! The ruffled top does not look bad!!! I would think it's a hard look to do with a wee belly... but it looks cute! Also: how droolworthy is that apartment? About the size of my current place, but it has those TDF windows!!! More Give and Get at Gap, Inc. 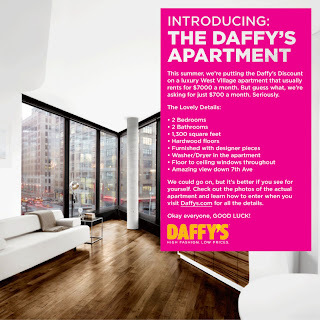 The Daffy's Apartment: Go Get It!